Next to July season, August too ends with huge tug of war between bulls and bears. Bulls Initially written 5300 Puts and slowly with 5400 Puts. Also there is a considerable OI builtup in 5600 Calls which guarded the bulls to hold below 5600 till the end of expiry…. As 5400 is considered as a main break point for bulls and…. even after breaking the points nifty is struggling in a rangebound movment and moving against the bullish traders expectation with low volatility. 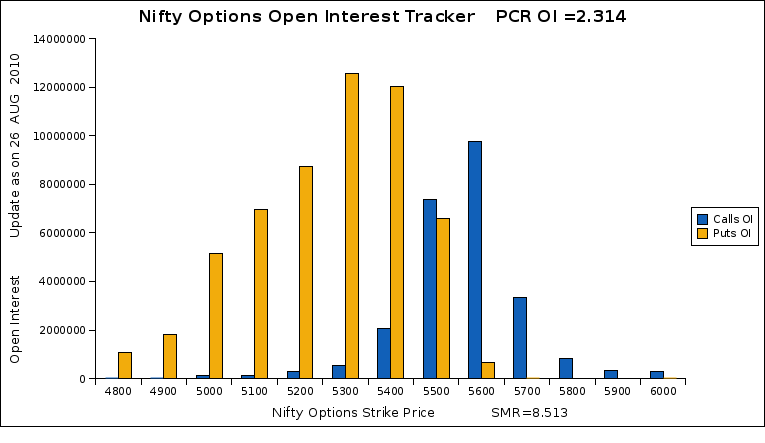 SMR(Smart money ratio is at the lowest ever… i.e at 8.51 and PCR OI at 2.31 which indicates sheer bullishness sentiment of put writters as huge number of puts(especially in 5300puts and 5400puts) are written when compare to the calls. could change the trend from bullish to bearish on EOD basis.